1 in 4 children use digital devices for more than 3 hours a day. Device usage poses a risk to children’s developing eyes. Blue light is emitted by digital devices and computer screens and may affect the retina and children’s vision. Caruso’s Blue Light Eye Protect is a tasty, kid’s chewable capsule which contains ingredients that may protect cells within the eye by absorbing high energy blue light and acting as an antioxidant to protect eyes from free radical damage. However did you know that these electronics may emit a "blue light"? Blue light is the highest energy wavelength of visible light. The "energy" is able to penetrate all the way to the back of the eye, through the eyes' natural filters. One of the biggest challanges that we as parents face each day is the amount of blue light that our children get from digital device use. Children are especially at risk of blue light as these days, a lot of homework is done onlinem and many children need to have access to digital devices for long periods of time. The important difference for children is that their eyes are still developing, and they may not have the protective pigments in their eyes to help filter out some of this blue light. So what can you do about blue light for your child's eyes? It is very important to give children the nutrients necessary for healthy hair and development, especially for their eyes. The nutrients which are the most important for children's eyes that can be found in Caruso's Kids Blue Light Eye Protect are omega 3 fatty acids (such as DHA) and the caratenoids lutein and zeaxanthin. These nutrients are highly concentrated in the brain and retina and both contribute to the development and protection of the brain and the eyes of children. The DHA found in Caruso's Kids Blue Light Eye Protect plays an essential role in the early deveopment of vision during infancy and childhood. It is involved in the transport of nutrients in and out of cells which helps to support mental, cognitive and visual development. DHA is present in high levels in the memnbranes of the retina and cerebral cortex of the brain and has been shown to be particularly important for optimal development of motor skills and visual acuity in children. Caruso's Kids Blue Light Eye Protect also contains Lutein which is a caratenoid that is naturally present in mother's milk. However once women stop breastfeeding children may not get enough through their diets. Lutein intakes are very important as it may help protect cells of the eye by absorbing blue light and acting as an antioxidant to protect ocular tissue from free radical damage. The macula and retina of the eye contains the yellow caratenoids Zeaxanthin and Lutein. These carontenoids are absorbed in the gut and ultimately deposited throughout the tissues of the eye. In the macula, the concentration of Lutein and Zeaxanthin is about the three times higher than the average concentration of carotenoids in other tissues of the body. This is because the retina is uniquely susceptible to oxidative damage compared with other tissues. Caruso's Kids BLue Light Eye Protect contains Lutemax2020 which is a blend of Lutein and Zeaxanthin. Antioxidant protection of the eye is vitally important in infants as they cannot down-regulate blood flow to the retina as well as adults; therefore, these vessels deliever excess oxygen to the retina and cause the generation of free radicals. Lutein and Zeaxanthin deposit primarily into the retina and act as antioxidant protectants and also absorb blue ight. 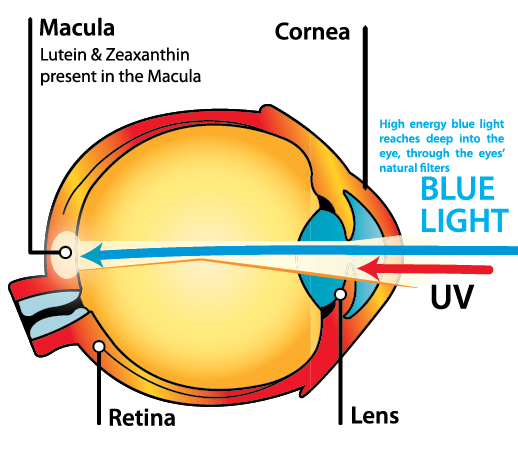 Lutein has the ability to block blue light may protect the retina from blue light. Both these nutrients are involced in visual development, however Lutein may also improve macular pigment density, glare recovery from light, and support contrast sensitivity in the eye. This may help with eye strain and minimise effects of blue light in children. Caruso's Kids Blue Light Eye Protect comes in a small 1 a day capsule which is suitable for children 5 yers and over. Children 5 years and over: Chew or swallow 1 capsule per day with main meal. Free from sugar, diary, lactose, wheat, yeast, salt, gluten, nuts. artifical colours, flavours or preservatives. Contains Fish Oil. Not to be used by children with seafood allergies. Take 2 hours away from other therapeutics.